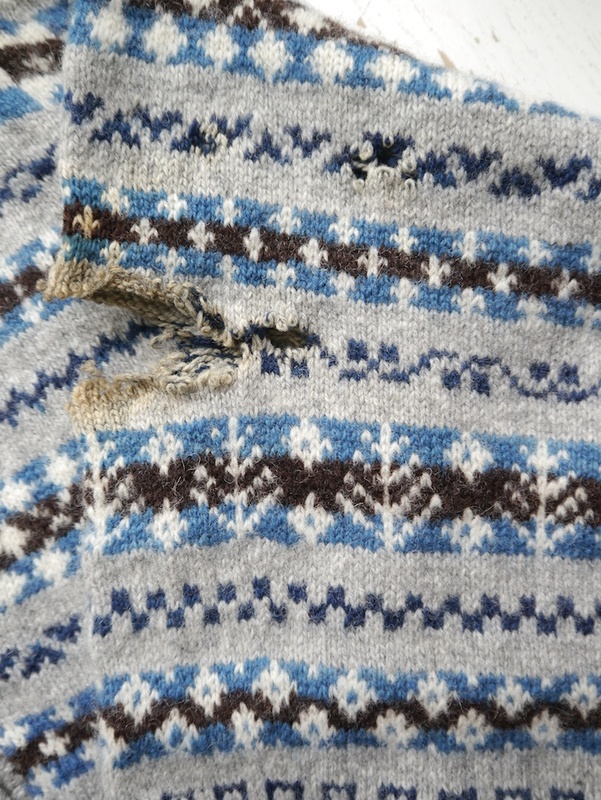 The lovely people at the Knitting & Crochet Guild believe that this damage may have been caused by some corrosive fluid that might have spilt onto it during a flooding at their archives. And indeed, when I was trying to tidy up the holes before starting the repairs, the stained wool was so brittle it almost crumbled in my hands. I have collected this as the Guild might be able to get it analysed at a forensics lab. There were four small holes and one large whopper. What follows is not a repair tutorial; instead I wanted to give you an insight in the technicalities of this repair. 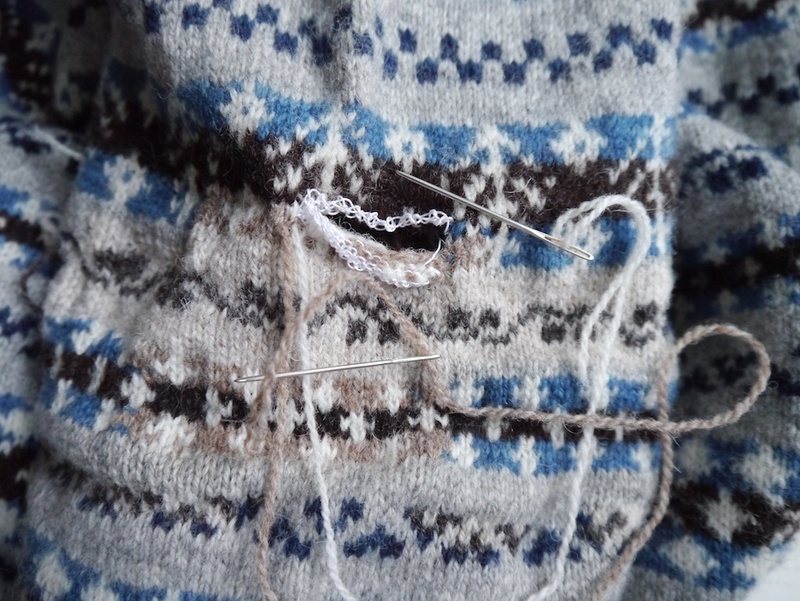 I first tackled the small holes with an advanced method of Swiss darning; or duplicate stitching as it’s also known. Usually you can simply embroider over the existing stitches, but to do this on a hole, you’ll first need to provide some support for the stitches you’re making with your tapestry needle. After that it’s simply a case of keeping track of the colours, just as if you were knitting the pattern. Once this was completed on four small holes I could start with the large hole. I wanted to employ a technique I had found in a very old Dutch booklet on teaching darning and repair skills to girls (seeing this book was originally published in 1888, of course it would only be girls that would need to learn these skills at the time; the authors would probably be mystified why I would want to use this book in earnest!) 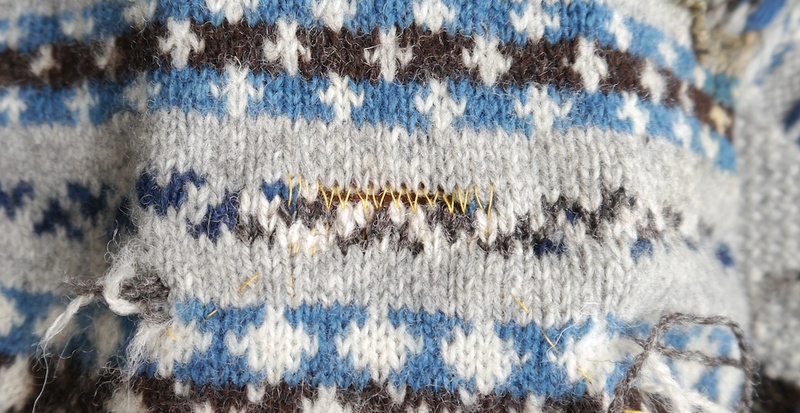 For this mending technique you knit every row with a new strand or strands of yarn for each row. The beginning of the strands of yarn are Swiss darned in over the stitches of the original fabric, and after knitting the row, the ends are darned in, too. The last row which will close the hole up, is grafted in place. After finishing off all the ends it was time for a wash ‘n’ block and the excitement of seeing the finished Visible Mend was almost too much to bear for me – this surely must be the technically most demanding repair I’ve done to date. 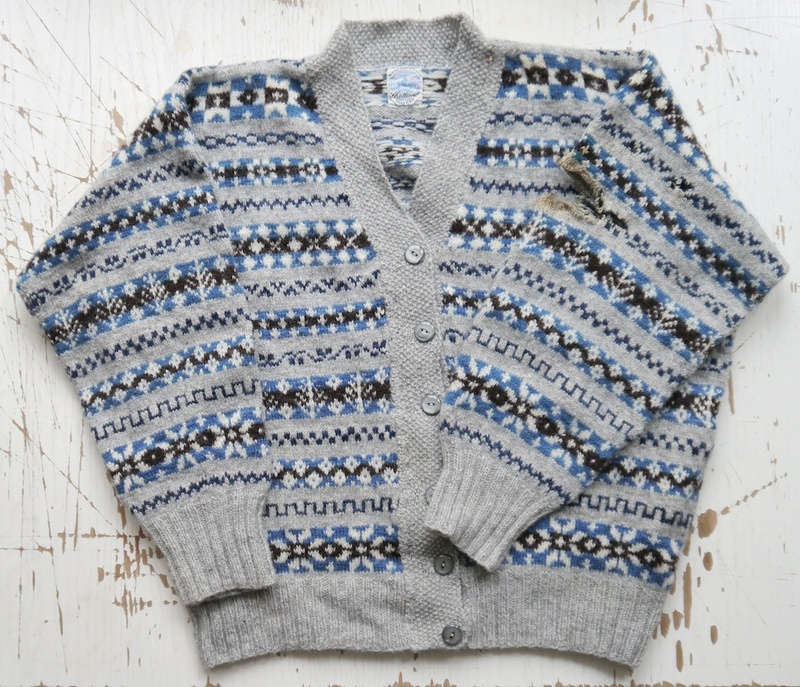 For this original Fair Isle hand-knit cardigan I wanted to stay close to its provenance. 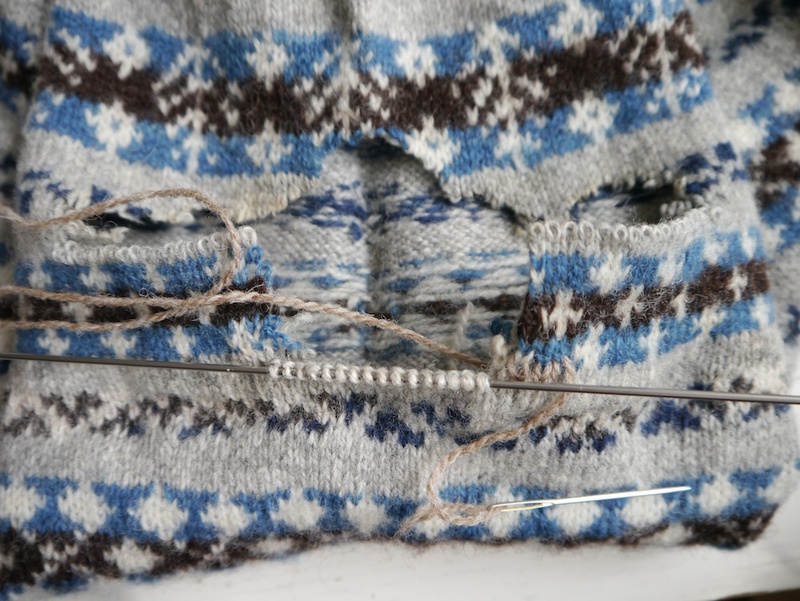 Therefore I wanted to use a Shetland wool for this repair. I settled on Jamieson & Smith’s Supreme jumper weight, as it comes in so many natural undyed shades. I set the camera on my mobile phone to take black-and-white pictures, and that way I chose the natural shades that came closest to the original colours, as seen in black-and-white. It turns out that the black-and-white filter on my phone gives different results than the one on my proper camera, as you will have to agree that in the following picture the Shetland Supreme shades look a bit lighter on the whole. Perhaps the light was different, too. Who knows. This weekend the Guild will have their annual convention and I’m pleased that this cardigan was ready in time to be shared with all Guild members. Angharad, volunteer Textile Archivist of the Knitting & Crochet Guild, emailed me to say she and her colleagues were very pleased with the end result, as they feel “it has made the garment into something very special whereas before it was very sad and folorn.” What a great result of such a lovely commission! I’ve known fellow glove knitting enthusiast Angharad Thomas for a few years now. Apart from knitting beautiful gloves she also volunteers for the Knitting & Crochet Guild as their Textiles Archivist. If you don’t know the guild, it was founded in Preston on 27 April 1978 for practitioners in the crafts of hand knitting, machine knitting and crochet. It’s a charity that aims to tackle the subjects of hand knitting, machine knitting and crochet at a higher technical level, encouraging critical approaches to technique and historical study and also recording contemporary developments. Angharad approached me for a commission to visibly mend a beautiful hand-knitted Fair Isle cardigan they hold in their collections. 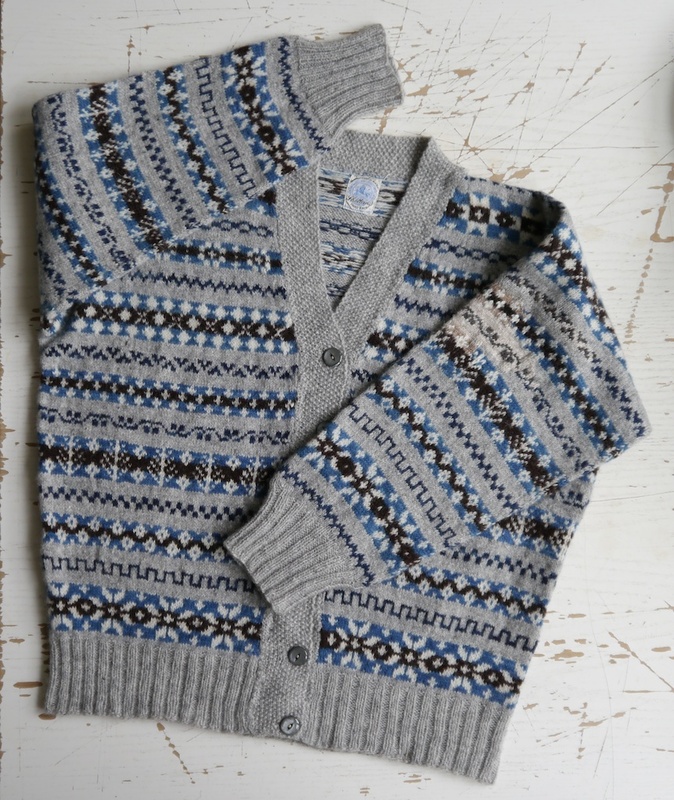 This Fair Isle cardigan bears a “Shetland Hand Knit” label, and a catalogue number from the Knitting & Crochet Guild archives. 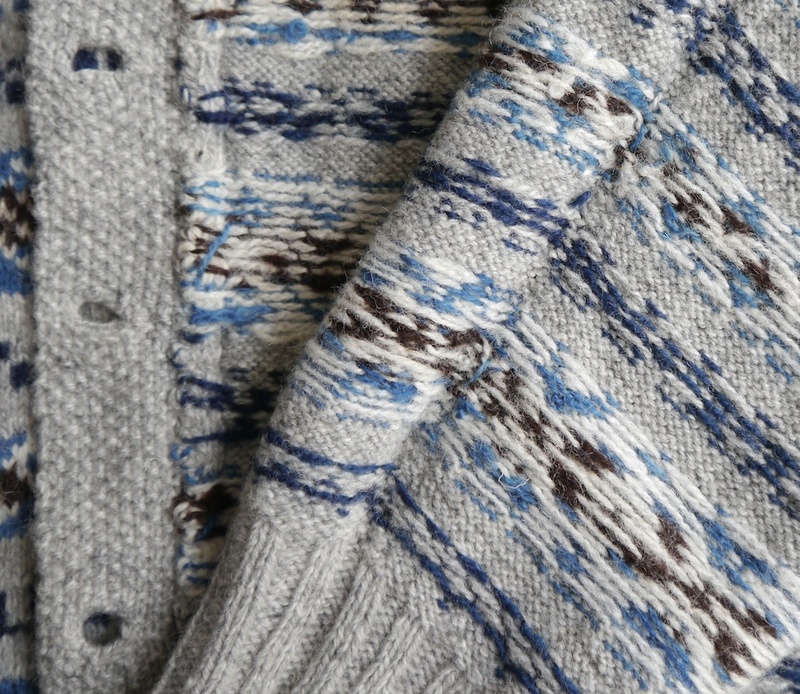 The cardigan has clearly been knitted in the round, as there are steek stitches that have been folded down. Both the neck and the armholes have been shaped, and there is no underarm gusset. 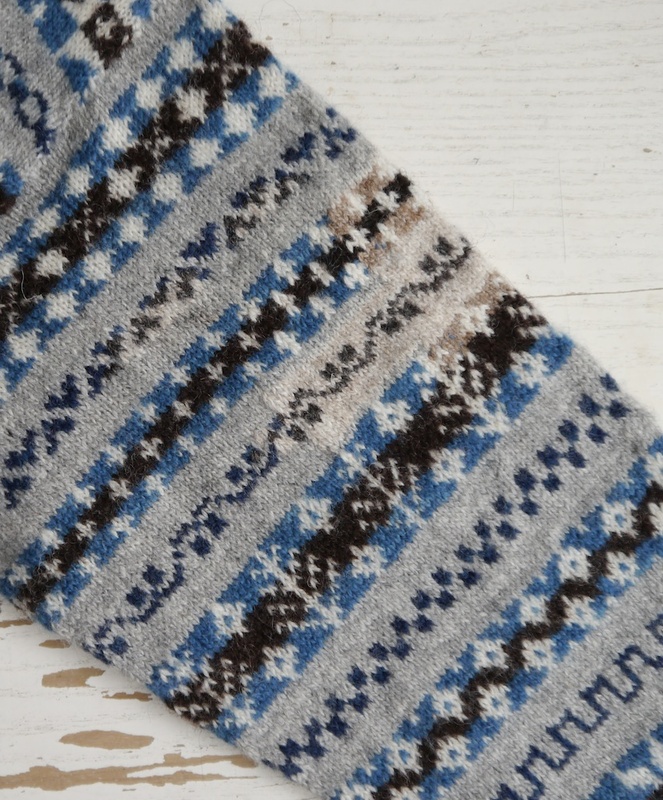 The lack of an underarm gusset doesn’t necessarily mean it’s an uncomfortable garment to wear; Kate Davies has written about this in a blog post about a vintage Fair Isle cardigan she owes. The sleeves have been knitted in the round, too, after picking up stitches up from armhole; there are decreases along the underarm seam. 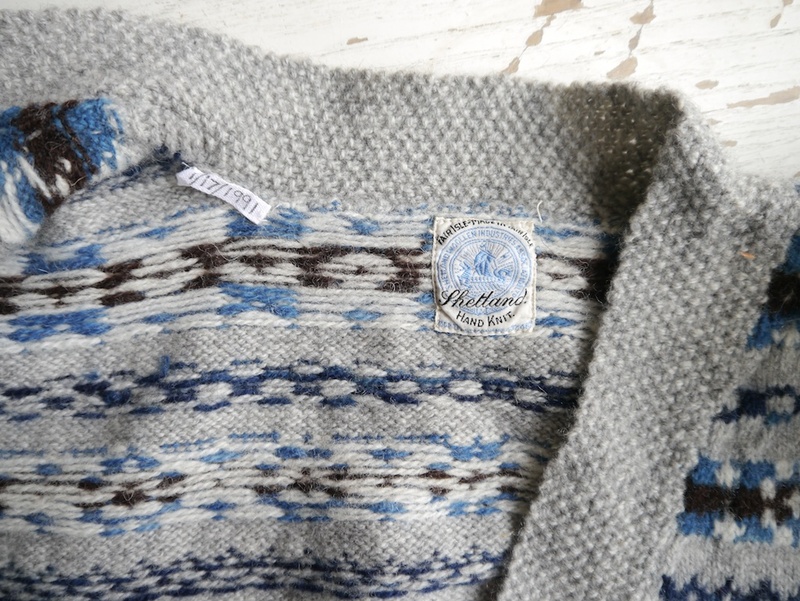 Examining the buttonband up close, reveals that it has been sewn on afterwards. That the steek was knitted in garter stitch, but only for the part of the neck-shaping. I was so impressed by the neat finish of sewing down the folded over edge, that I ended up looking really closely, and then realised that the edge was not folded inward, but outwards. 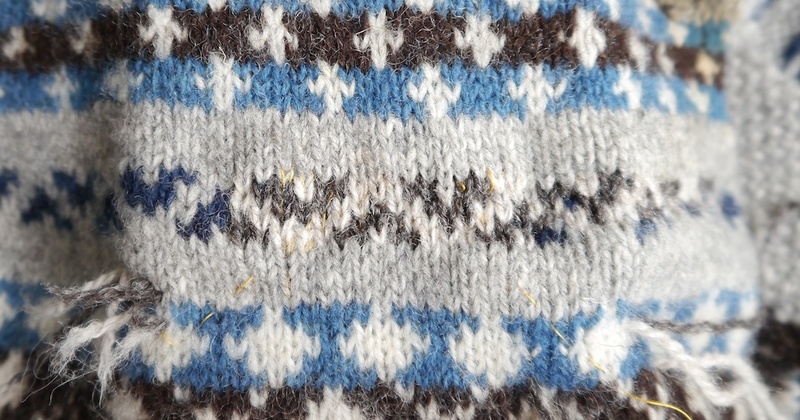 The steek stitches were purled, not knitted, using the background colour only, and then folded outwards. The buttonband hides this as by sewing down the very edge of it, the cut edge has been hidden. Then the edge of the fold is sewn down against the buttonband. However, it’s extremely difficult to be certain about this, as by using the same grey yarn and very neat sewing, it’s almost completely camouflaged. The pattern colour yarn is mostly hidden inside this fold. A new technique to be tried out! 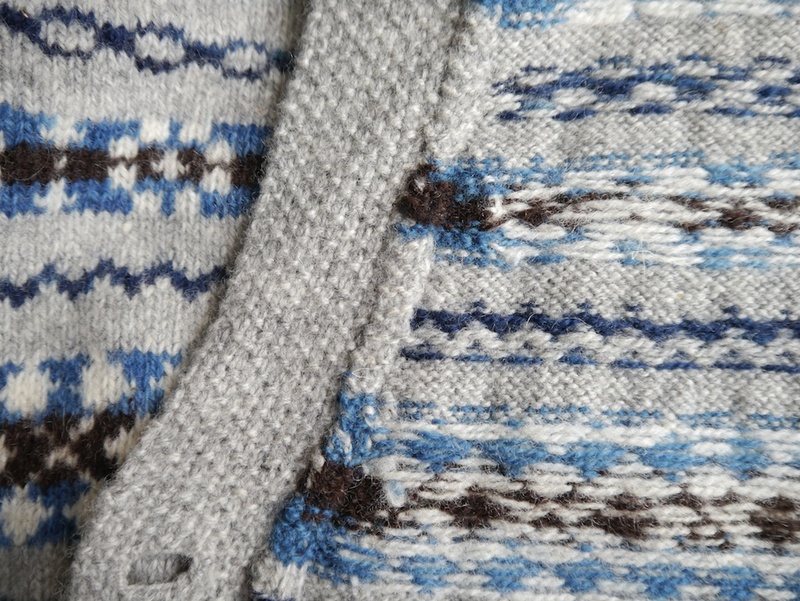 The underarm seam also shows a very neat approach to the working in of yarn ends. The colours are carried up along the rounds until a whole motif has been knitted, leaving very few strands to work in at the end. So far, so good, but perhaps you have started to wonder why the Knitting & Crochet Guild contacted me for a repair commission? There is a big hole in one of the sleeves. Angharad and her colleagues at the Guild think that the damage may possible be caused by caustic or corrosive liquids, perhaps in the flood that occurred at their Lee Mills archive some while ago. The horror of a damaged sleeve! Luckily I like a challenge and I’m really excited that the Guild has asked me to repair this beautiful cardigan. I’ll keep my repair strategy a secret until I’ve returned the mended cardigan to the Guild, but if anybody is familiar with the following old Dutch book on marking, darning and damask darning, I’ll be using one of the techniques it discusses. The title translated from the Dutch: The Feminine Handicrafts for School and House; marking, darning and Swiss darning. 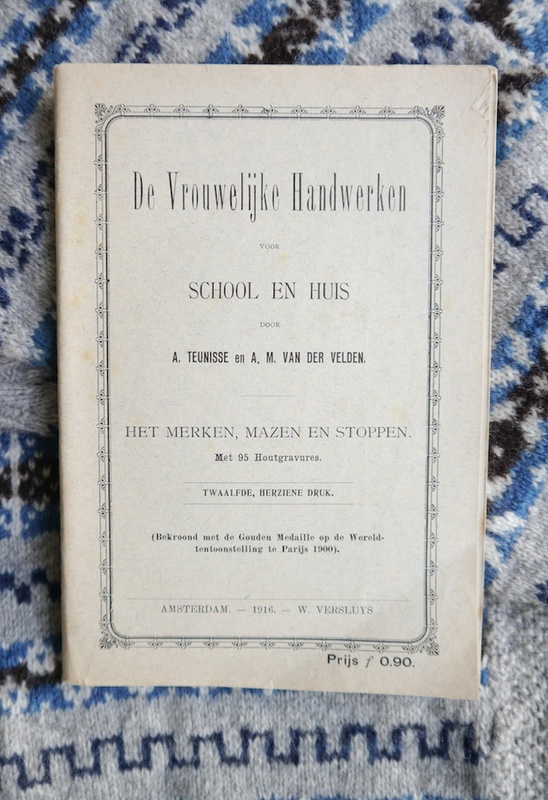 De Vrouwelijke Handwerken voor School en Huis; Het Merken, Mazen en Stoppen (The Feminine Handicrafts for School and House; marking, darning and Swiss darning), written by A Theunisse and AM van der Velden in 1888, was written for teaching needlework, and is part of a small series – the other two volumes cover sewing and knitting. 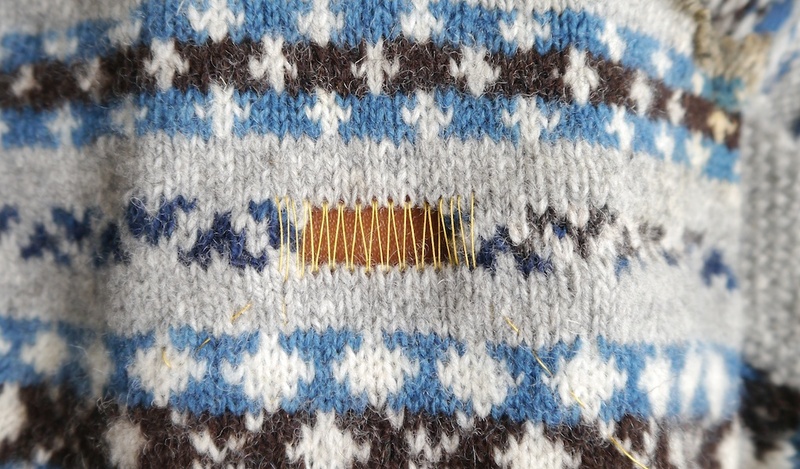 It shows how to teach marking (embroidering initials into clothes for identification purposes during laundry day,) repairing woven fabric by means of darning, and repairing knitwear by means of Swiss darning and other techniques. 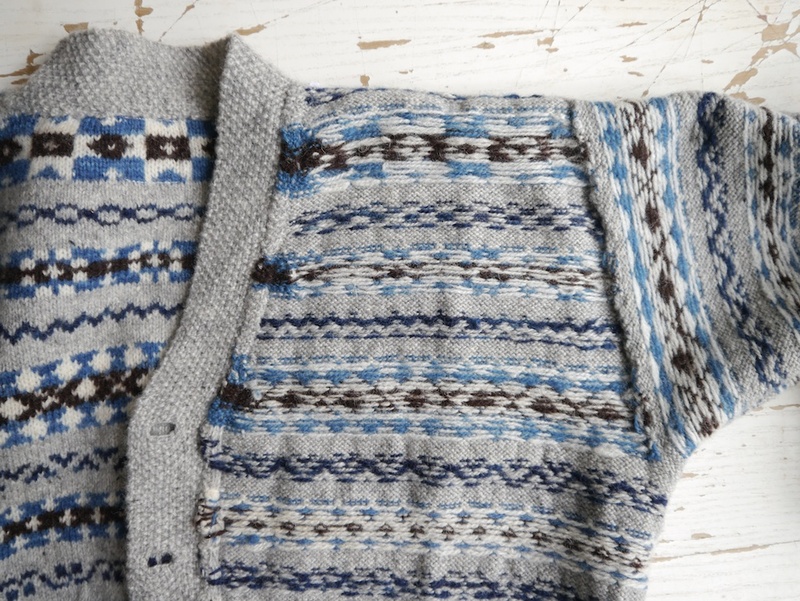 Keep an eye out for the follow-up post where I will show you how this book has helped me repair this beautiful Fair Isle cardigan!